Tides of Life is located at 16 Public Square, Suite A-5, Shelbyville, IN 46176. ***Please note that some GPS devices have issues with this address and will send you to another downtown business and/or the wrong direction on the circle/rotary traffic pattern. 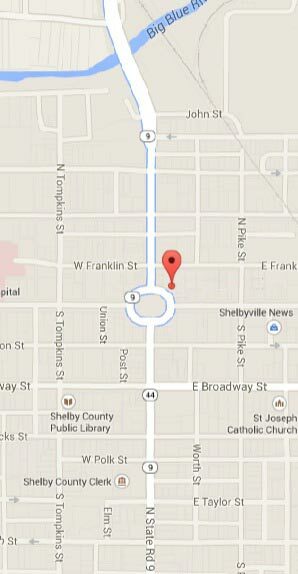 As you approach downtown Shelbyville, you will be faced with a circle/rotary traffic pattern that sends traffic in a counterclockwise circular direction. This is the Public Square. Find a place to park. Tides of Life is located on the NE corner of the Public Square. It is directly north of "18 on The Square Restaurant", Edward Jones Office and Liberty Tax. Tides of Life is in a one story Grey building, blue awnings and has a small "16" on the door. When you enter 16 Public Square, go down the hallway and enter the first door on the right, "Suite A"
There will be a clipboard of paperwork on the table in the waiting room. Make yourself comfortable while you fill out the forms. Someone will be with you shortly.